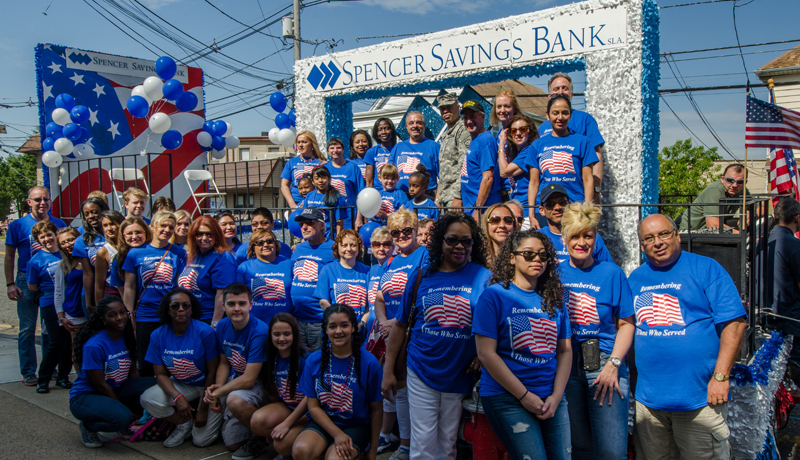 Spencer Savings Bank, a community bank headquartered in Elmwood Park, NJ, proudly participated as the main event sponsor in Garfield’s Memorial Day Parade on Monday, May 25th. The parade was on hiatus since 1998 however this year, Garfield’s Mayor Tana Raymond and the city’s event planning and recreation committee, brought back the community tradition to honor our fallen soldiers and veterans, as well as provide a day of fun and community gathering. As the main event sponsor, Spencer Savings Bank took the lead, both in the parade route as well as in generating a strong community spirit of remembrance and celebration. The Spencer team wore blue t-shirts with the American flag on the front and “Serving the Garfield Community for over 75 Years” on the reverse. Their parade float was decorated in red, white and blue, and they played patriotic music along the way taking moments to recognize members of their team who have served, are serving, and have lost loved ones that served. Along the parade route, they handed out American flags and candy to the spectators which were a big hit. Mayor Raymond remarked during the opening ceremony how wonderful it is to see so many American flags at the event, not just with Spencer’s team, but within the entire community that had gathered that day. The parade route wrapped up at Babe Ruth field where vendors were ready to serve food and cold refreshments. Spencer had their booth set up inviting community members to spin the wheel for a prize and let them know about all that Spencer has to offer. “It was an amazing day for the Garfield community. The Memorial Day Parade tradition has been renewed and members of our community had an opportunity to gather together and have fun on a day with such beautiful weather. We hope to continue to serve the Garfield community for many more years to come,” said Marzena Czachor, Vice President and Garfield Branch Manager. Spencer Savings Bank has been serving the Garfield community for over 75 years, with the Bank’s original headquarters situated on Passaic Street. A second branch opened on Outwater Lane in 1956. As the community grew, Spencer opened their third branch in Garfield on River Drive in 1985. Throughout the years, Spencer has evolved to serve the banking needs of the ever-changing community, continuing to be deeply committed to serving and helping the community achieve their goals.